Cut Stone Example from This Lot! NOT INCLUDED! 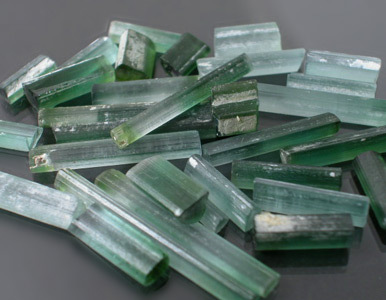 Incredible Lot of bi and tri-colored Afghan Tourmaline that runs from a pale steel white to an electric bluish green & green with some stones having a weird lemony greenish yellow cap. 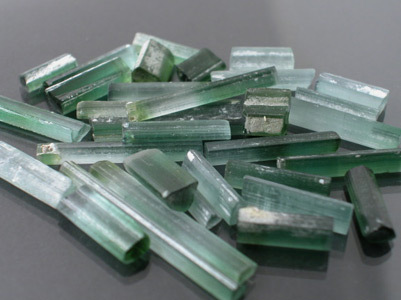 There are green and blue-green bicolors as well as pieces in here that run the stretch of 4 colors or more in a single crystal! This lot is running roughly 90%+ Top Facet Grade with most stones capable of producing eye-clean or better finished gems. Most of these stones are crystal sections with a sizeable portion being fully terminated crystals at both ends! 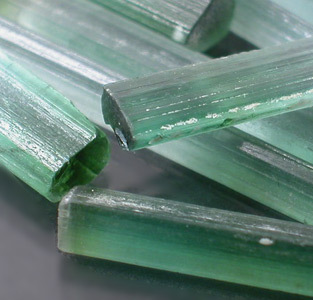 This was a very unusual find of Tourmaline in Afghanistan that we picked up at a discount. We are now passing that discount onto you! This material is SPECTACULAR once cut and we have included a quick picture above! We have cut only about 3 pieces of this at the request of our Afghan Partner to see how the material looked once cut. Since this was a VERY small pocket we picked up the entire production and only have a limited amount left. 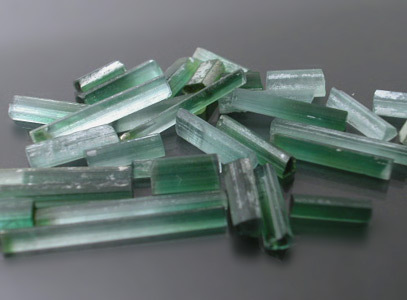 You will rarely see Afghan Tourmaline at this per carat price in this size range! Don't miss this deal!